As I've said in a previous blog post, I am a huge news junkie, and as I was perusing the news sites, I came upon an update regarding the ban on laptops and other electronics on inbound flights to the US from Reuters. Originally, this electronics ban was slated for flights that originated in the Middle East and targeted those airlines specifically (Turkish Airlines, Royal Jordanian, Emirates, Etihad, and Qatar Airways among others) due to the possibility of terrorists sneaking explosives concealed in electronic devices. 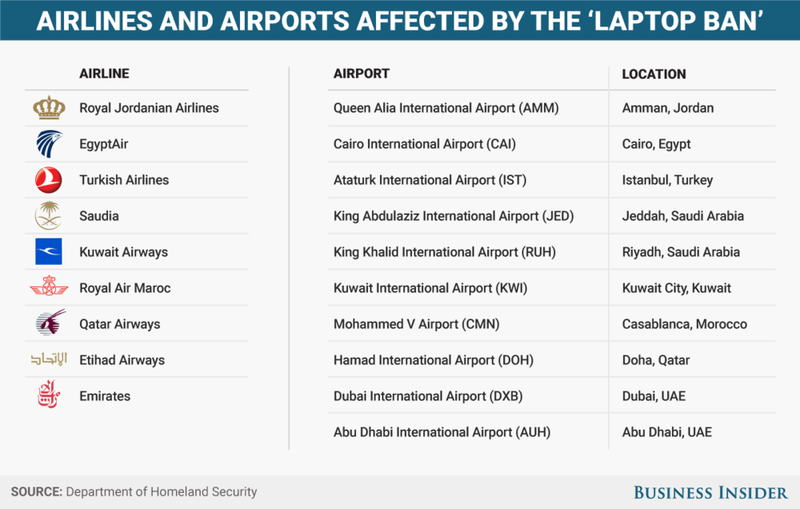 As an expat who is based in the Middle East and who travels relatively frequently on Turkish Airlines, Royal Jordanian, and Qatar Airways, I can say in all honesty that this laptop ban has caused definite headaches. The original ban came into effect when I was traveling throughout the Southern Cone of South America, but when I received word of it, it was not clear whether it affected flights that were inbound and outbound or just inbound. This put me into a state of nervousness and uncertainty because I often travel with a DSLR, laptop, and occasionally an iPad. The thought of putting these things into a checked bag definitely did not play well with me. What if something was stolen or damaged? Who would be held responsible? Plus, I have seen baggage handlers on more than one occasion throwing luggage and roughly shoving bags off the transports onto the tarmac without any care. I certainly would not want to have my electronics in a bag that is treated like that by baggage handlers. Luckily, the laptop ban did not affect me when I flew from the US to Jordan in April 2017, but with this possible new expansion in Europe, this will definitely impact my plans for whenever I return to the US. Originally, my plan would have been to fly from the Middle East to Europe, kick around Europe for a bit then go from Europe to the US. However, if this expansion becomes official, this method will be useless. However, some airlines have developed ways around this ban, and now the issue is trying to find which airlines take special precautions with electronics if they must be checked. Of course, I would not be the only one impacted. As CNN Money reported re: the expanded laptop ban, this could have a huge effect on the US economy along with aviation and tourist industry since this ban will most certainly put people off visiting the US for either leisure or business. I'm not an expert in aviation or security, but in my personal opinion, I would prefer to have extra security screenings at airports for electronics rather than banning them from the main cabin. This would mean longer lines at the airport, but I would personally feel more at ease knowing my electronics were in a safe place either under the seat or in the overhead bin and not at the mercy of baggage handlers. I will definitely be keeping up with this development. What are your thoughts on this? Has the electronics ban affected you?